Alison is one of my sister, Meagan's best friends, and I have recently been lucky enough to acquire her and her fiance as new clients. I am so excited as Alison is crafty, imaginative, thoughtful and loves a good glass of wine and some wedding chatter. 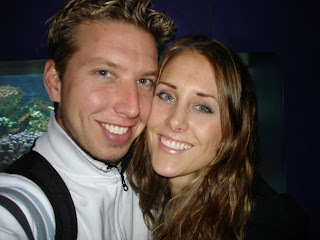 Her and Graham are getting married June 19th, 2010 at the Calgary Zoo, and I cannot wait to be part of their wonderful day. First, I have to go back to my family to explain where Ali fits in. Anyone who knows me, knows I have three sisters (and four step-sisters too!) and they are my very best friends. Anyone who is a friend to them is close to my heart as well. My sisters have been away from Calgary for sometime. Krista my puppetering sister who has written numerous plays, has a dream of owning a puppet farm (to normal people, this would be an artists retreat), and whom I appear to be a carbon copy of, lives in Toronto. Meagan has just recently graduated from Bond University, on the Gold Coast of Australia and before that, worked for Club Med and travelled the world, lives in Ottawa, we think maybe she's there to become Prime Minister. And my little sister Caitlin, who graduated from ACAD last year and is an amazing painter who has graced our whole house with her beautiful work, is currently in the Outback of Australia cooking for cowboys and having crazy and wild adventures. I miss my sisters dearly and would do anything for them, but since they are not here to actually visit with, I feel very blessed to have a few of their good friends keep me company, and this is where Ali fits in. She's been kind of part of the family, as some of my best friends have been, for years, and am so happy to be collaborating with her creativity to see to it that her dream wedding comes true! 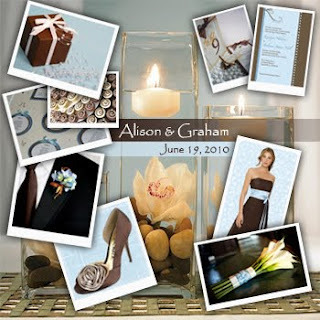 Before I stepped into their wedding picture, Ali had a full binder of pictures, ideas, magazine cut outs, websites, dress patterns and contacts. This is fantastic, as it gives me some sort of concrete foundation to build upon. I love that Ali is decisive, but only after testing out, or "auditioning" vendors. This is a great thing to do so that you feel 100% comfortable with your choices. This is one of the biggest days of your life and one where you can actually call all the shots. You're the boss and you are hiring these people (thanks for not auditioning other wedding planners Ali!). We have had several lengthy visits about flowers, centerpieces, dresses and the palette. The palette for this wedding took a few tries to get it right. I love that Graham actually puts in his two cents about the wedding and vocalizes whether or not he likes something. The first palette Ali and I discussed, was ivory, sea foam and chocolate brown. Soothing, calming natural sea colours that they also have integrated into their home, so it only made sense to use these on their big day. This scheme actually posed quite a challenge, every one's thoughts on what "sea foam" was varied greatly and I struggled a bit with finding matching elements. This worried me a bit, as if I had trouble matching the colours just for the palette, then I though we would find it difficult to find decor, dresses, ties, flowers, accessories and centerpieces that all fell in the correct sea foam column. After this, we discussed maybe doing a celedon or apple green and brown, which Ali loved but Graham was not a big fan of. 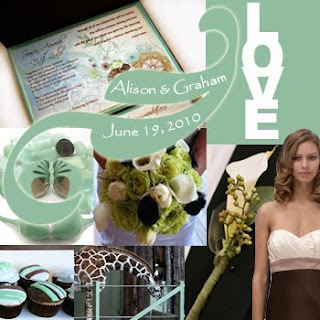 Then Ali came to me with the idea of a powder blue and chocolate brown with ivory accents. I thought this would be a wonderful choice, as the blue would be more consistent, and was only a bit different than her initial palette. I went to work and gave Josh his job of coming up with the palette below, and I think it turned out beautiful, and best of all, both the bride and groom to be loved it! Having my sisters far away is so hard, but having their close friends near by is the next best thing. I am so honored to be working with Ali and Graham and am going to attempt to patiently wait for next June to arrive.